To give some of Sydney’s player’s travelling down to Melbourne for the Asian Cup some much needed practice, Subbuteo Parramatta organised a low-key WASPA tournament. 5 players (3 of whom will be heading to Melbourne) competed in a league, while another new player, Dan, came along to watch and learn, and played a couple of friendly matches. 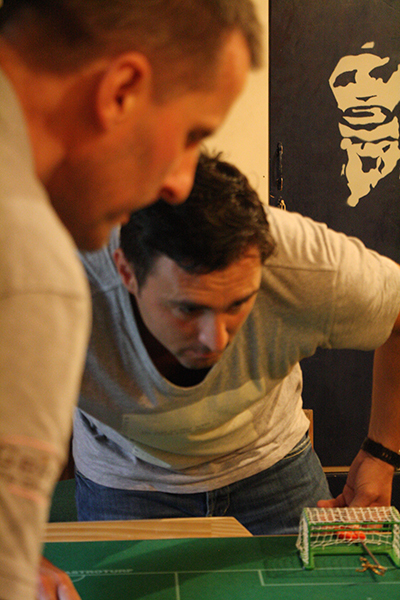 Intense concentration from Robert and Raffaele. Early games saw Adrian beat Raffaele in a competitive match for the first time, while Robert, over from Sweden for the Asian Cup(s), got off to a smooth start with a 4-0 victory over Daniele. Daniele held out for a 0-0 draw against Adrian while Fabrizio, playing with his own Italian U19 champion winning figures which he recently had sent across from Italy, got over Raffaele (who was trialling his own new figures) 2-1. In the day’s biggest surprise, Adrian managed a 1-0 victory over Fabrizio. Unfortunately, the battle of the Lombardi brothers didn’t offer it’s usual verbal fireworks as the two battled it out in tense near-silence, Raffaele finishing with a 1 goal advantage. Heading into the final game between Robert and Fabrizio, both players had a mathematical chance to win the tournament, while Adrian also looked on with interest as a victory to Robert would secure him 2nd place. By the middle of the second half, Robert had secured a two goal lead. However, Fabrizio was making it uncomfortable. One swift counter-attack happened so quickly Robert was left watching from the wrong end of the table, luckily seeing the ball crash into the side netting. But Fabrizio got his goal with a few minutes to go, meaning the match would go down to the wire. Robert held on to take the title with a perfect point tally. The result also meant Adrian took second place with Fabrizio close behind in 3rd. Fabrizio v Daniele with new boy Daniel looking on. 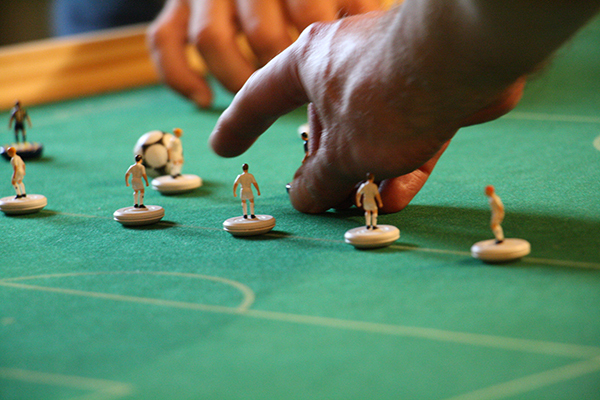 As ever, a tournament played in great spirit, with players giving each other hints and tips on everything from tactics to figures, as well as history lessons from some of the great Italian and Australian Subbuteo achievements of the past. Hopefully, the match practice will also come in handy once the competition down south kicks in next weekend. For more photos head to the Subbuteo Parramatta Facebook page. 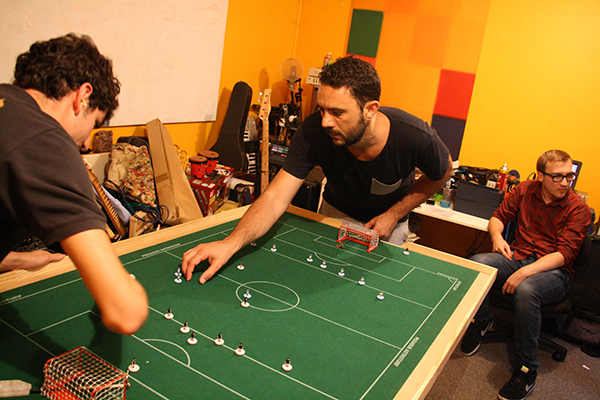 This entry was posted in News, Tournament reports and tagged adrian elmer, daniel wilkes, daniele lombardi, fabrizio coco, raffaele lombardi, robert green, subbuteo parramatta, waspa tournament on 12/01/2015 by ajebec.